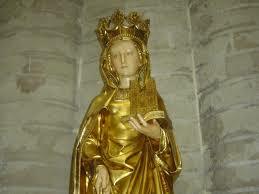 ST. AMALBERGE, mother of this saint, was niece to Pepin mayor of the palace. Gudula was educated at Nivelle, under the care of St. Gertrude, her cousin and god-mother; after whose death, in 664, she returned to the house of count Witger, her father, and having by vow consecrated her virginity to God, led there a most austere holy life, in watching, fasting, and prayer. By her profuse alms, in which she bestowed her whole revenue on the poor, she was truly the mother of all the distressed; though her father’s castle was two miles from the church of our Saviour at Morzelle, she went thither early every morning, with a maid to carry a lantern before her; and the wax taper being once put out, is said to have miraculously lighted again at her prayers, whence she is usually represented in pictures with a lantern. She died on the 8th of January, not in 670, as Miræus says, but in 712, and was buried at Ham, near Villevord. In the reign of Charlemagne, her body was removed to the church of our Saviour at Morzelle, and placed behind the high altar; this emperor, out of veneration for her memory, often resorted thither to pray, and founded there a nunnery, which soon after changed its name of St. Saviour for that of St. Goule: this house was destroyed in the irruptions of the Normans. The relics of St. Gudula, by the care of Charles, duke of Lorrain, (in which Brabant was then comprised,) were translated to Brussels, in 978, where they were first deposited in the church of St. Gery, but in 1047, removed into the great collegiate church of St. Michael, since called from her St. Gudula’s. See her life wrote by Hubert of Brabant, in the eleventh century, soon after this translation of her relics to St. Michael’s, who assures us, that he took the whole relation from an ancient life of this saint, having only changed the order and style.